A cocktail dress worn by Audrey Hepburn in the 1966 film How to Steal a Million has been sold at auction for £60,000. The Chantilly lace outfit, by Hepburn's favourite designer Hubert de Givenchy, was among dozens of her dresses, hats, belts and letters being sold. A satin bridal gown for a wedding called off by Hepburn in 1952, when the late star was 23, sold for £13,800. Some £268,320 was raised in the auction at La Galleria in central London, with half the proceeds going to charity. The Givenchy dress was worn by Hepburn in a scene set in the bar of London's Ritz Hotel in How to Steal a Million. The Oscar-winning actress, who died in 1993, starred opposite Peter O'Toole in the crime romance. 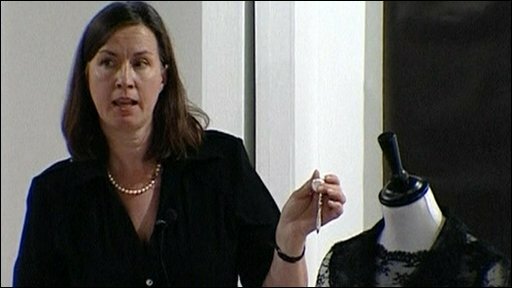 Her dress attracted a winning bid of £50,000, rising to £60,000 once fees and taxes had been factored in. In 2007, a cocktail dress worn by Hepburn in the classic Breakfast at Tiffany's sold in the US for almost £100,000.